In the 1910 era, Canada was experiencing an enormous increase in population in both the Eastern cities and on the plains out West. Before 1900, the new arrivals to Canada were mostly from Great Britain and the United States, but this all changed around 1905 with the Wheat Boom.In an October 19, 1911 interview, Bruce Walker, Assistant Superintendent of Immigration, explained to the New York Times about Canada’s 1910 Immigration Act – designed to maintain the pre-1900 arrangement. The Act, Walker said, gave him complete control over immigration ensuring that Canada got ‘the cream of the immigrants’ leaving ‘the skim milk’ to the U.S.
Only the best people were allowed into Canada, Walker explained, and if they couldn’t prove they were doing well after 3 years, or if they committed a crime, they were out. He said that Canada needed farmers out West, not people herding to the cities. Scots and Englishman were preferred over everyone else; tough Yorkshiremen preferred over the softer Hampshire farmers. Americans came in second. Peasants from northern France, northern Germany, Belgium, Denmark, Scandinavia and Iceland were also welcome. The poor and idle, from any country, weren’t encouraged to come to Canada. “The men who depend upon carrying someone’s purse across Blackfriars Bridge, for sixpence” should stay put. Southern Europeans weren’t wanted either. Canada was virtually slum-free and crime-free, continued Walker – lying through his teeth – and the new Immigration Act would ensure that undesirables did not come into the country. He cited many examples from Anarchist Emma Goldman to a boatload of Syrians recently turned away from Halifax Harbour. As it happens, very few of the ‘desirable’ Northern Europeans came to farm out West, preferring to stay at home. It was Eastern Europeans who took advantage of the call, especially Ukrainians. Many were escaping persecution. 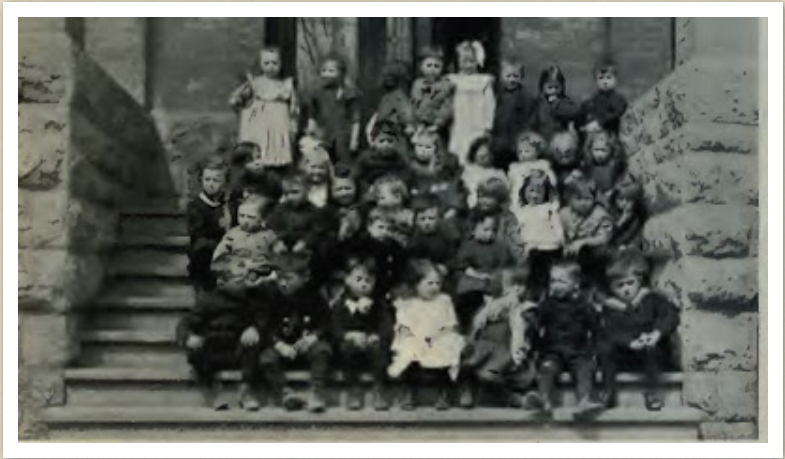 Immigrant children in Winnipeg School (Canadian Magazine 1912: The Refining Process by Charles Chipman). Poles, Hungarians, Ruthenians, Russians, Roumanians, Hebrews, Swedes, Danish, Norwegians and Syrians. These immigrants will be refined through the school system, claims the article. If that doesn’t work, compassionate juvenile courts will straighten out the young offenders. True, there was a pressing need for construction workers in Montreal and Toronto where, despite Walker’s best efforts, the population was also increasing in leaps and bounds, largely due to the pogroms in Eastern Europe. Homes and especially schools had to be built to accommodate these new Canadians. Montreal’s leafy Mile End District was expanding in the era. According to the 1914 Canada Yearbook, between 1901 and 1911, Montreal was the fastest growing city in Canada, its population increasing from 267, 730 to 470, 480, swelling with immigrants as well as young Canadians moving from the farms and towns to the big city to find work. The Macdonald College Campus completed 1907 . The Ste. 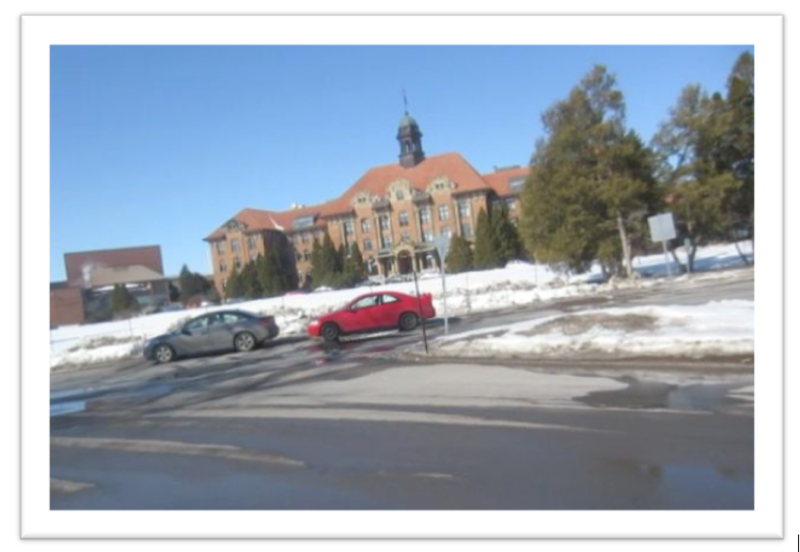 Anne de Bellevue campus was built by Italian labour. Barb Angus reads a story from Beads in a Necklace: Family Stories of Genealogy Ensemble in Beaconsfield. 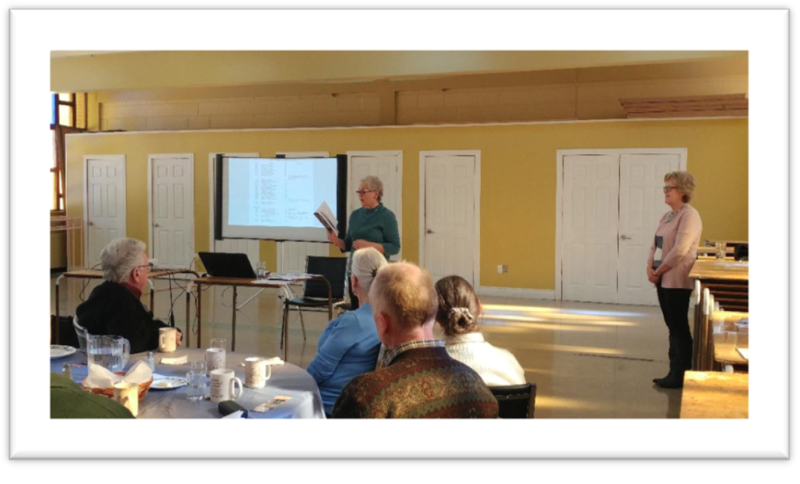 On February 19, Barb Angus and Lucy Anglin led a How to Write Your Family Stories presentation at the Beaconsfield United Church in Beaconsfield, Quebec. Between 40 and 50 people showed up, so you can say the presentation was a shining success! A luncheon was served before the presentation, something new for our presentations. Five copies of Beads in a Necklace were sold and several in the audience signed up for our Writing Tips. That, in a nutshell, is our goal at Genealogy Ensemble: to inspire people to write their own family stories. If you would like a copy of Beads in a Necklace: Family Stories from Genealogy Ensemble, it is available here on Amazon Kindle. For people with Irish ancestors in Quebec, Jacques lists the Irish Catholic churches in some the following areas of Quebec: Arthabaska, Compton, Frontenac, Megantic, Wolfe Counties;Lanaudiere and Yamaska; Quebec City; the Eastern Townships; Bagot, Brome, Missisqua and Shefford Counties. In another post, Jacques explains, with a step-by-stop approach, how Quebec’s guardianship records (Tutelle and Curatelle) can help you solve brick walls with respect to ancestors in the Quebec City and Montreal regions. The latest batch of stories posted on Genealogy Ensemble shows that there are many ways to write a compelling family story. Our authors have used diaries, letters, newspaper clippings and traditional genealogical tools. Street names come in handy, too. In Polio in the Family, Sandra McHugh offers up more fascinating social history writing about her Aunt Elsie’s polio and explains how Elsie’s childhood in Scotland ensured that she wouldn’t be left behind due to her affliction. 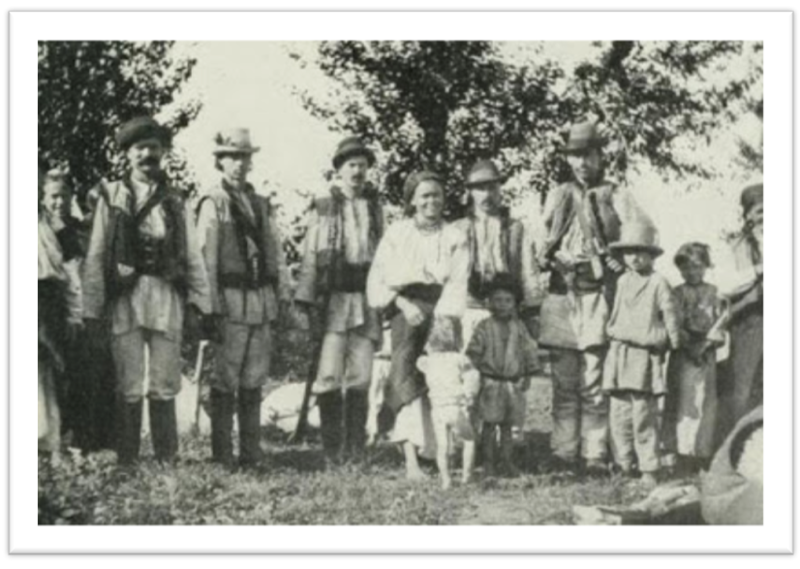 Claire Lindell, whose father is of Finnish descent, describes how a black and white photo of the Lindell family reunion in Ohio, discovered on the Internet many years ago, inspired her to become a genealogist. Read Family Reunions here. Lucy Anglin posts the third part in her story about her parents’ long and eventful courtship in The Courtship of Anne and Tommy, part 3. The trilogy, inspired by family letters, culminates with Lucy’s parents designing and building a lovely new home in Montreal. Imagine that! In T.G. Hamilton’s Busy Life, Janice Hamilton explores the life of an accomplished Winnipeg medical doctor who became internationally famous for his investigations into psychic phenomena. Hamilton and his wife actually held seances in their home. For people who know the NDG/Snowdon area of Montreal, Mary Sutherland writes about her ancestors, the Decaries and the Prud’hommes. Hmm. Those names sound awfully familiar, don’t they? 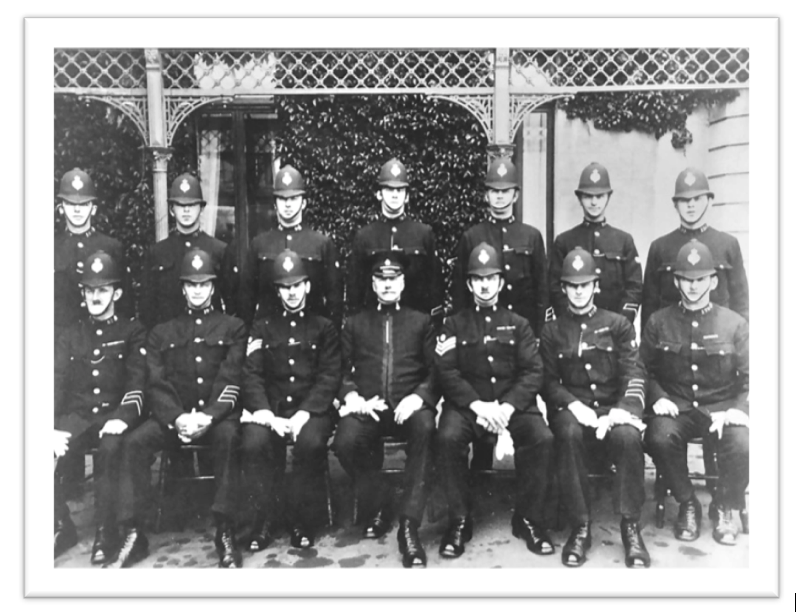 Marian Bulford continues to explore the interesting – and sometimes gruesome – police career of her Grampy, Francis Bulford of Cornwall, England in A Policeman’s Lot is not a Happy One. Dorothy Nixon writes about an energetic Richmond, Quebec woman’s internal tug-of-war in Biology and Ambition – using information from a 1907 ‘dating’ diary. This story might change your perceptions about courtship in the Edwardian era. No stuffy chaperones here. Read the Washington Post’s recent St. Patrick’s Day story: When Irish Immigrants were America’s Most Feared Terrorist Group. Henry Ford revolutionized American life, but not only with his assembly lines, five dollar a day salary and cheap autos. He also pro-actively ‘Americanized’ the immigrants, the Poles, Russians, Roumanians, Italians, Sicilians and Austro-Hungarians, who came to work in his factories. In order to share in the profits of the company, workers had to live in ‘proper’ homes and have the ‘proper’ habits – and that included eating habits. Ford actually sent his inspectors into his workers’ houses to tell the woman of the house to lose the perogies and make macaroni and cheese instead. Americans arriving in Canada by the trainload to claim homesteads in 1910. 5,206, 315 Canada’s population in 1901.7, 206, 643: Canada’s population in 1911. 331,288: No of new arrivals in 1911. 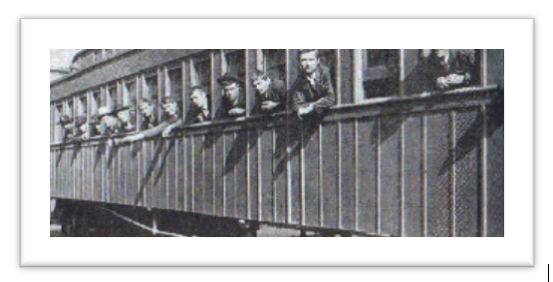 375,756: No of New arrivals in 1912, the largest percentage-per-population of all time. 400, 870: Immigrants arriving in Canada in 1913.
a Technical World Magazine June,1910 article, Building a Town a Day. 1907 speech. House of Commons by James W. Robertson, first Principal of Macdonald College and leader of the Macdonald Robertson Movement for Rural Education. CIHM document. When researching your Italian ancestors who immigrated to North America, remember that many Italian men came without their families to find work – at least at first. These men often went back and forth across the Atlantic a few times, so one doesn’t necessarily look for family groups when researching these ancestors. It might be more useful to look for a group of men on passenger lists, all from the same town going to work on the same mine or construction project. When you introduce an individual into your narrative or begin a book chapter, do not start with the person’s birth. Introduce the person with an anecdote, description or statement about his or her significance in the family story. Then you can flash back to describe the person’s birth, life and death in more detail. From Writing Tips from Genealogy Ensemble by Janice Hamilton and Tracey Arial. 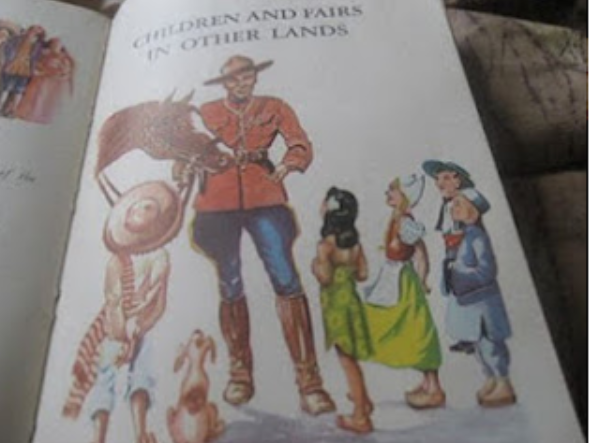 Below: A kindly Mountie looks down upon some ‘ethnic’ children in a drawing in Wide Open Windows, 8th grade reader in the Canadian Reading Development Series used in classrooms across the country from the 1940’s to the 1970’s. These readers were all about promoting Canadian values – mostly of the rural variety.